Horsing around in city streets is usually prohibited, unless it involves participants in the annual All Horse Parade. The 33rd installment of the parade will march through Delaware starting at 3 p.m. on Sunday, Sept. 9. 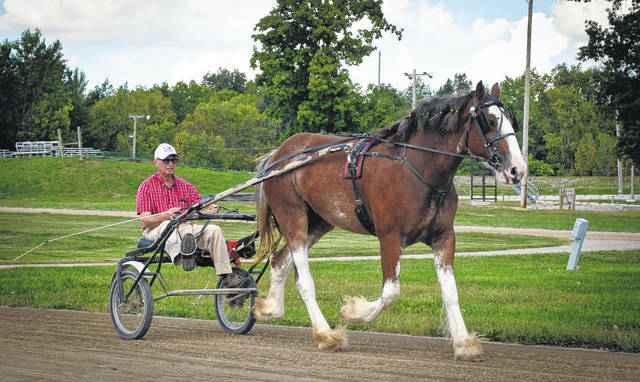 According to event organizers, the parade is one of the largest east of the Mississippi River, and it serves as a lead-in to the upcoming Delaware County Fair, which will take place Sept. 15-22. “Tom Homan, Delaware city manager, told us that we host the largest event in Delaware,” said Diane Winters, a coordinator of the parade. Winters said when the parade began in 1986, there were 50 to 60 horses entered into the parade, but in recent years, the number now “floats between 300 to 500 horses.” She said the total number of horses each year is dependent on the weather and the day. Winters said she was once told by Bill Lowe, former Delaware County Fair manager, the group is the luckiest committee ever by having their own window in the weather to put on the event. She said there hadn’t been any rainouts in 37 years. The highly charged horse parade is a three-mile route beginning at the county fairgrounds main gate on Pennsylvania Avenue, east to North Sandusky Street, south to West Winter Street, west to North Liberty Street, north to Lincoln Avenue, west to Euclid Avenue and north to the fairgrounds. According to Winters, the parade showcases 350 to 500 horses each year, pulling in 50,000 to 90,000 spectators from all around the world like Canada and Australia. Winters said Debbie and Gary King have announced the parade for over 20 years. She said with Gary’s recent passing, he will be honored in this year’s parade. Fisher raises draft horses and usually enters them and a wagon into the parade. According to Fisher, people will set up tents in front of their homes, put out lawn chairs and invite family and friends to watch the parade with them. He said some make a game out of it by marking numbers in chalk on the road and betting on which numbers the horses might drop some road apples on. “It’s the best put together parade anywhere,” he said. This entry was tagged All Horse Parade, Bill Fisher, D. Anthony Botkin, delaware, Diane Winters, ohio, Princess Leia. Bookmark the permalink.